A Leeds law firm which employs almost 100 people has changed its name as part of a major rebrand. Michael Lewin Solicitors, based on Roundhay Road, Leeds, has been rebranded as Oakwood Solicitors in a move which underlines the firm’s links with the Oakwood area of the city and the local community. Managing director and owner Abbie Keech said: “I grew up around Roundhay Park so the local community is close to my heart. As a business, we are part of Oakwood. We employ 95 people and every day our staff use the local shops and eateries, so the new name for the business makes absolute sense. Established in 2001, Michael Lewin Solicitors has grown steadily from a local practice specialising in personal injury claims to today’s modern full-service legal practice. Ms Keech joined the business in 2004 and became the owner three years ago. She said: “When I took over, it was clear that personal injury wasn’t for the long term and that there were other things we could offer so we have added wills and conveyancing and commercial litigation, contract and respondent work, negligence etc. In all, we have added six or seven departments in only three years. “We’re now a decent sized practice with potential for significant future growth. When I look at a lot of the prominent practices in the centre of Leeds, I see severe glass-fronted offices, and I think some potential clients look at those kinds of offices and believe that their fees are going on maintaining those kinds of edifices. To emphasise those community links, the rebrand was launched at the children’s play area in Roundhay Park. 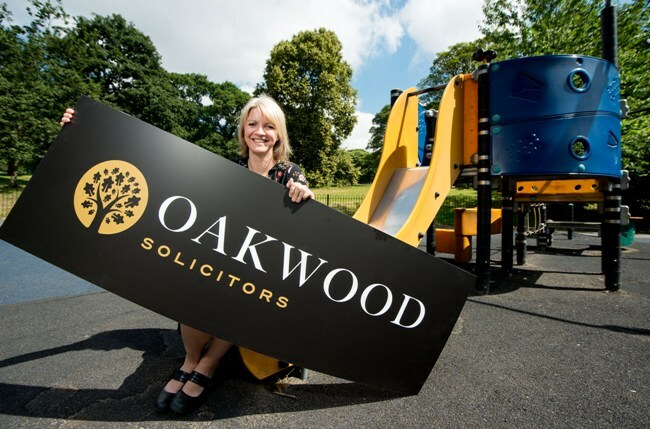 Oakwood Solicitors has donated £1,200 to the Roundhay Playground Appeal which is trying to raise £100,000 to refurbish the existing play area and add facilities for disabled children. “I have got three children who are aged three, five and seven so I know how important it is to have nice playground facilities. A lot of our staff bring their kids here, and people do need something that’s a bit better than what is currently here,” said Ms Keech. Oakwood Solicitors’ growth reflects the continuing importance of the legal sector to the Leeds economy. The city remains second only to London for the scale of its legal services and Oakwood believes it can punch above its weight, not just locally, but on the national stage as well. “Our business is growing at a healthy rate, and there are several areas where we think we can have an impact nationally in the next few years,” said Ms Keech.